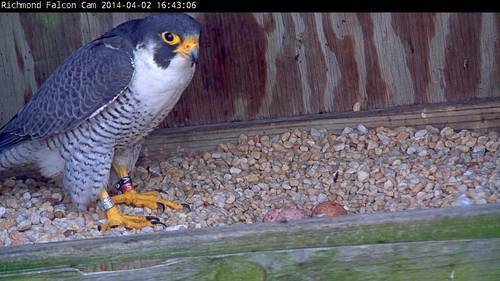 Over the past two days we have consistently observed three eggs during incubation exchanges between the male and the female. As the time interval between egg-laying generally does not exceed 72 hrs, it appears that this year’s clutch was completed when the third egg was laid on March 28 or 29. This is not the first time that this pair lays a 3-egg clutch. They did the same in 2005, at a time when they had not yet begun nesting at the current site. The eggs are being actively incubated full-time, and are expected to hatch between 33 and 35 days from the onset of incubation. 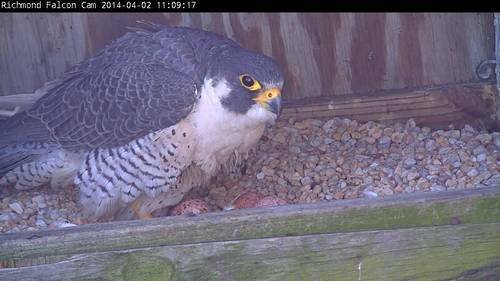 We are looking forward to the first egg hatching in late April/early May.